Languages: Oriya, Hindi, English and Tribal languages. Temperature: Max. 31° C in summer.Min. 10° C in winter. Keonjhar offers varieties of attractions to the tourists. The natural settings of the districts are so marvellous that it creates a niche in the minds of the visiting tourists. It is the most convenient base from where visitors can plan their visit to various places on interest in the district. Vishnu Temple, Jagannath Temple, Siddha Jagannath, Siddha Kali and Panchabati are situated in the heart of the town. Sanghaghara: A beautiful picturesque waterfall, 100ft. high, which is 5 Km away from Keonjhar, suitable for outings. Sanghagara Falls: This fall (30 mts.) lying about 5 km from Keonjhar while the Badghagara fall (60 mts.) about 10 km from Keonjhar are amongst the most popular picnic sites in the region. Another pretty spot is Gonasika (45 km from Keonjhar) where the Vaitarani River goes underground briefly, and jumps out further down over a stone projection like the nostril of a cow. Badghaghar: Badghaghar is 10 km from Keonjhar an exciting waterfall of 200 ft. high, which is beautiful picnic spot. 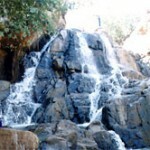 Badaghagra: The Badghagra falls, which is about 60 mts., situated around 10 km from Keonjhar is amongst the most popular picnic site in the region. One look at the beauty and serenity of the place is enough to understand why visitors make a beeline for it. Gonasika: Surrounded by a series of valleys and wooded hills of varying colours, the place is famous as a centre of pilgrimage for the temple of Brahmeswar Mahadev in the bank of the river, Baitarani the place from where the river starts flowing. A little away from the point of origin, the river goes underground and hence called Guptaganga only to be seen jumping after a short distance over a stone projection looking like the nostril of a Cow. It is 45 Kms. from Keonjhar. Khandadhar Falls: Amidst lush green forest about 60 km from Keonjhar. One of the prettiest districts on the tourist circuit is the Sundargarh region, located amidst its lush forest is Orissa most famous waterfalls the Khandadhar falls (244 mts). It makes a great picnic spot. It lies about 104 km from Rourkela via Bonaigarh, which is 19 km from the waterfall. The last couple of meters are purely a trekker’s delight. Murga Mahadev: Murga Mahadev is 70 Kms. from Keonjhar, situated near the Thakurani Hill in Champua subdivision by the side of a perennial spring famous for the temple of Murga Mahadeva. There is a beautiful waterfall and good picnic spot also. Ghatagaon: Ghatagaon is situated 50 Kms. from Keonjhar on the State Highway No.11 towards Cuttack, famous throughout the state for the Shrine of Goddess Tarini situated in the midst of deep forests presiding deity of the district. Sitabinji: Sitabinji is situated on the river Sita- famous for ancient fresco painting on a rock shelter called “Ravana Chhaya” which is like a half-opened umbrella. The painting depicts a royal procession, 30 Kms. from Keonjhar. Deogaon: On the bank of the Kusai River near Anandapur, the temple of Kusaleswar built in 900 AD is famous for the seat of Buddhism. A 5 feet high image of Avalokiteswar stands they’re as a reminiscence of the Buddhist activities in the past. This entry was posted in Keonjhar, Orissa. Bookmark the permalink.